It is my understanding that most people really don't like cockroaches. I think my first experience with Cockroaches came when I saw Creepshow when I was little. I don't remember knowing what a cockroach was back then; I just remember there being a bunch of scary, disgusting bugs. In the years after that, I heard many people on TV and in movies complain about cockroaches, so it was pretty clear to me that these things were not to be tolerated. 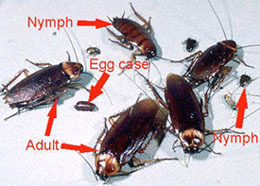 As it turns out, I never saw my first real-life cockroach until I was 19, crawling in the underground tunnel connecting dorms. Actually, that was the second one I saw; the first one I ever saw was about a week before that, and it was dead, so I didn't really count it. But I knew that what I saw on the ground was a really revolting little thing. I can tolerate ants, and bees, and flies, etc but there's something about cockroaches that is just unnerving. Wait, I can't really tolerate ants. But I can't put my finger on what makes cockroaches so bad. Is it their size? Those things can get pretty big. I don't remember ever not feeling squeamish about a bug that was as big as my thumb. Even harmless june bugs. I remember a horde of those things crawling all over the garage, and that was kind of frightening. So there's the size, but now that I think about it, it is probably their size combined with their quickness that makes them so unsettling. I have an infestation of them in my kitchen. They always come out at night. The big ones always manage to elude me, they're so damn fast. Then there are little itty bitty ones that are a bit easier to catch. In any case, I don't like the feeling knowing that they're crawling all around the crevices that every kitchen has but you never notice. I don't know how cockroaches affect the ecosystem or food web or whatever, but I am certainly disturbed by the fact that these things have been around for millions and millions of years. And it's said that they'll be around for millions more. I hope that future generations will somehow be able to conquer these creatures. I just don't like 'em.